Michelle Aitken recently returned to Seattle have spent the last 15 years working in ceramics in London and Edinburgh. Originally from Seattle where she studied ceramics under Patrick Siler at Washington State University. She worked with Kate Malone for over eight years in London and Barcelona. She moved to Edinburgh in 2009 where she developed her own ceramics practice at the Adam Pottery Studio and Gallery. 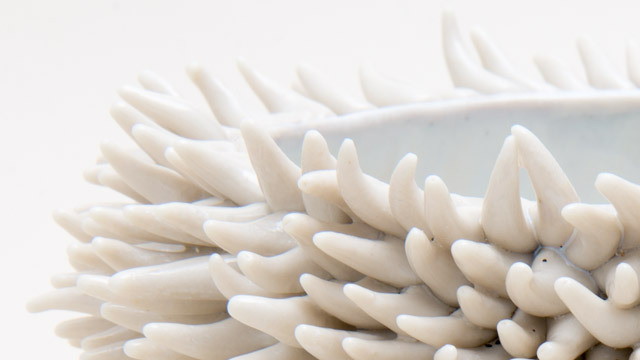 In 2015 Michelle returned to Seattle where she now makes hand made ceramics in her studio. Michelle draws inspiration from a lifelong connection with coastlines having had a childhood spent exploring beaches and tidal pools. The shapes and patterns created by the sea have been a constant source of inspiration.